Hurricane Matthew destroyed many of the island’s natural dunes, so the Town of Hilton Head Island has placed wooden sand fences on about 10 miles of beach to catch wind-blown sand and build new dunes. 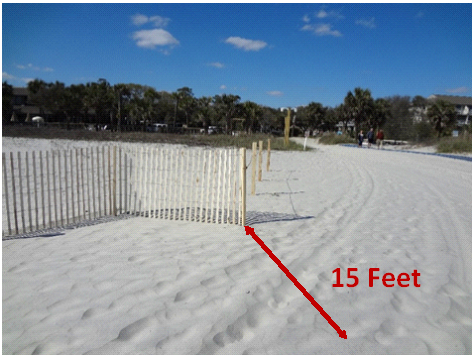 Native dune plants have been planted in front of, between and behind these fences. These plants help catch additional sand and anchor the sand with their roots, to help stabilize our new dunes. Dunes help protect upland properties during storms and create habitat for many of our native species, such as sea turtles, six-lined racerunner lizards and dwarf live oaks. Our dunes help us, now let’s help our dunes! Thank you for helping us keep Hilton Head Island beaches beautiful! !